An ounce of prevention helps save you pounds of cure. We can help you avoid costly or unnecessary repairs through a regular program of preventive maintenance. We’ll outline the best plan for your vehicle based on the manufacturer’s specifications, and we’ll help you stay on schedule so you’ll have the peace of mind that comes with knowing your vehicle is in top condition. We also perform a free 20-point inspection of your vehicle every time it’s serviced. Why the dealer isn’t necessarily your best deal. You may assume the best place to have your car serviced is at a dealer, since they sell your make and model. But Yingling’s ASE-Certified Technicians are required to service more makes and models, so they have a broader range of knowledge and experience, and superior diagnostic skills, compared to most dealership mechanics. Our state-of-the-art tools, equipment and information systems often surpass those at dealer service departments. And while we focus on your ongoing service needs, dealerships are frequently inundated with recall and warranty work. Let’s face it, dealerships are primarily interested in selling more cars; Yingling’s is committed to building lasting relationships with our customers, year after year, car after car. Are you using the shotgun approach to car care? 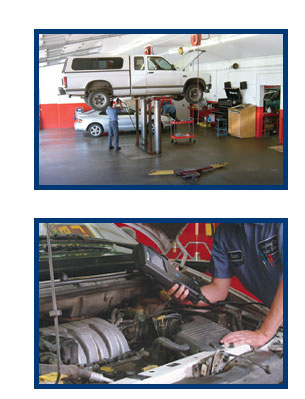 Some of our customers used to take their vehicles to quick lube chains, dealerships, brake shops, muffler shops and so on—until they realized Yingling’s could provide complete, expert service all under one roof. In addition to being more convenient for you, we’ll maintain a comprehensive service history for your vehicle, so we’ll always know what it needs to stay in peak condition, saving you money over the long run.